Makeup. I have this love-hate kind of relationship with it. Face Wash: Purifying Face Cleanser – If a face wash could be soft, this would be the one. The consistency is heavenly, causing me to be absolutely addicted morning and night. Toner: Pro-glycolic Resurfacing Gel – I’m an addict and I can’t go back. This pH balancing toner has been by far one of the best topical products I’ve ever used. I haven’t broken out since I started using this. Moisturizer: Hydrating Day & Night Cream – This moisturizer is addictive — I honestly won’t put on makeup without it! I have incredibly sensitive skin, after just recovering from 5-10 years of on-and-off acne (read the full post on how I overcame it here). So the above is important to me! My natural everyday go-to makeup routine is CC cream, bronzer, under-eye concealer, and a brow pencil. See products that say: *MY EVERYDAY GO TO* for my everyday natural makeup products. The rest are items that I have in my makeup bag for heavier makeup looks. CC Cream: Supergoop! CC cream in light/medium – MY EVERYDAY GO TO* the best lightweight foundation around, sometimes I don’t even add foundation or powder on top of this because it has a mattifying tint to it. The best part? It has SPF! Spot Cover-up: MAC ProLongwear Concealer – I dot this over acne scars or pimples before I apply powder. It has full coverage – but doesn’t go too far or look cake-y. You can also use this for your under-eye – but it’s not as thick as most under-eye concealers. Matte Powder Foundation: bareMinerals Matte Foundation Powder – Here’s the cherry on top for foundation. The matte powder gets rid of any shine. You can continuously add layers until you reach the coverage you like. I suggest using this brush – you won’t regret it. 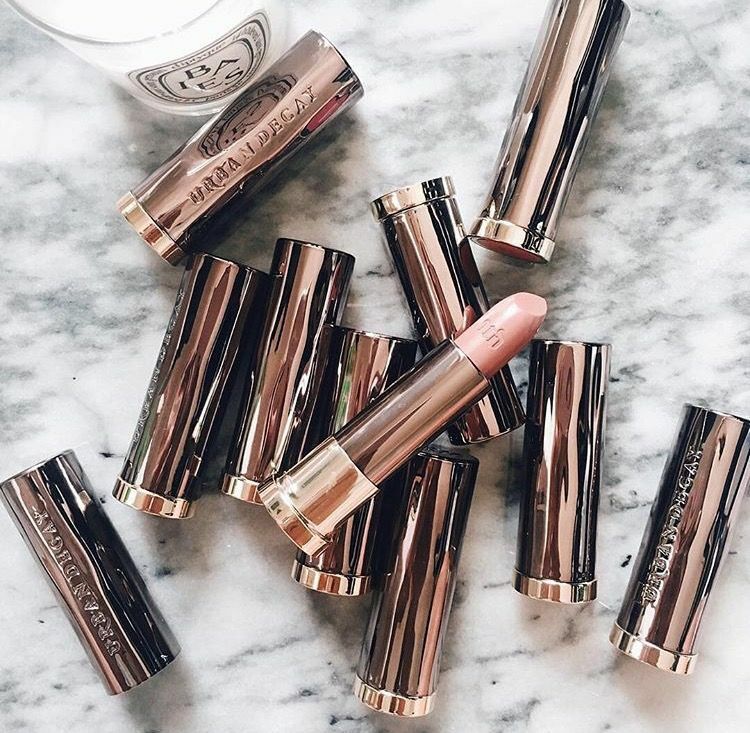 All Day Wear: If there’s a day I need makeup from 7am-10pm, Estee Lauder has got me covered. This All Day (lightweight) Pro Longwear Foundation lasts all day, even though a spin class. Don’t believe it? Try it yourself! Bronzer: MAC Skinfinish bronzer – MY EVERYDAY GO TO* I actually don’t wear blush just because I feel like I always put it on wrong (ha! ), so bronzer is my easy go-to. I prefer a matte bronzer over a sparkly one and this one is perfection. Highlighter: Becca Shimmering Skin Perfector Highlighter in Moonstone – I only wear this for shoots, but adding it above my cheekbone gives my face a shimmery glow. Again, since I have incredibly sensitive skin, the products I use for foundation are chosen for a lighter and more sensitive coverage. Under-eye Concealer: MY EVERYDAY GO TO* If you’re looking for a thicker coverage, Tarte Shape Tape is incredible. credit for both concealers: Courtney Shields. | Cheaper alternative: Maybelline Dark Circle Concealer – I’m half Persian, so yes, dark circles are an issue. However, I prefer my under-eye to look natural over thick with coverup. Here’s a favorite that even my mom loves to wear + it’s cheap! Under-eye Liner: MAC ‘Embark’ Eyeshadow + Angled Brush – I’ve been wearing eyeshadow under my eyes since high school and I’ll never go back. I use the angled brush to lightly outline the eye with a dark brown color – which looks natural and lasts for hours. TIP: you can find an angled brush at a grocery store for a cheaper price! Top Eye Liner: STILA All Day Liquid Eyeliner – I swear by using a felt tip liner and it’s another since-high-school-favorite (that’s when you know it’s a keeper). This liner actually lasts all day. TIP: if you have eyelash extensions, do not use this on your extensions! Try use a dark eye shadow and this brush to create the same look. Eyeshadow: When it comes to everyday wear, I don’t wear eyeshadow. However, I sometimes go for an all-in-one palette of brown and neutral tones and apply a beige to my lid. You could find this at the drugstore, but here’s a favorite palette that goes day-to-night and lasts months (if not years). Brows: Anastasia Beverly Hills Brow Pencil – MY EVERYDAY GO TO* I just started using this brow pencil and I’m addicted (and I’m not the only one). The Anastasia team has mastered the brow game and I’m smitten. TIP: make sure you get the right color; I’ve been wearing the wrong color for awhile now, and adjusting to the right color was a game changer! TIP 2: If there’s a day when I’m wearing absolutely no makeup at all, I always wear this brow pencil and a touch of under-eye concealer for a natural look. PS – I don’t know what it is – but defined brows are just so “in” right now. Austin: I get my brows waxed at At Hello Lash Salon and they do an incredible job! Lash Curler: I get my natural lashes permanently lifted by my friends at At Hello Lash Studio – it’s a quick 45 minute procedure that harmlessly lifts your natural lashes for a permanent curled lash look. I get them re-lifted every 4-6 weeks. Before I started getting lash lifts, I used SHISEIDO Eyelash Curler – Everyone says this one’s the best and I tried it out and loved it too. But honestly, I’ve used drugstore buys in the past and loved those too. Lash Primer: Lancome Mascara Primer – When it comes to blogging, being photographed adds a new level of expectation to putting on makeup (especially the eyes). This primer has done wonders to adding volume to my lashes, specifically volume that shows up in the photographs too! If you don’t ever want to get eyelash extensions and you want thick full lashes, try this primer! Coat your lashes in the primer, wait 30 seconds, then apply mascara. Favorite Mascara: MY EVERYDAY GO TO* Too Faced Mascara (my new obsession for volume and length, CC: @cmcoving) OR L’oreal Telescopic Mascara – the golden ticket to long skinny lashes. Got this rec from my girl, Dani Austin, and I’ll never go back! Plus I love the price tag. Favorite Volume / High-end Mascara: Lancome Hypnose Drama Full Volume Mascara – My favorite mascara ever. Bring on the volume. That’s all that needs to be said (see the next option for a drugstore alternative!). Favorite Drugstore Mascara: Maybelline Butterfly Mascara – I learned about this mascara from my previous boss, Camille Styles, and I always keep an extra around ever since. I love the winged applicator and the consistency of this mascara. It does not disappoint! Lip Pencil – MAC Lip Pencil Color ‘Boldly Bare’ – I use this color because it goes with almost every “natural” lipstick ever! Liquid Lipstick – BUXOM Contouring Matte Lip Color in color ‘Centerfold’ – My new obsession, this plumping liquid lipstick adds shape, color, and a matted look. I haven’t had trouble wearing this lip, but I only just started wearing it last week! So far, so good. 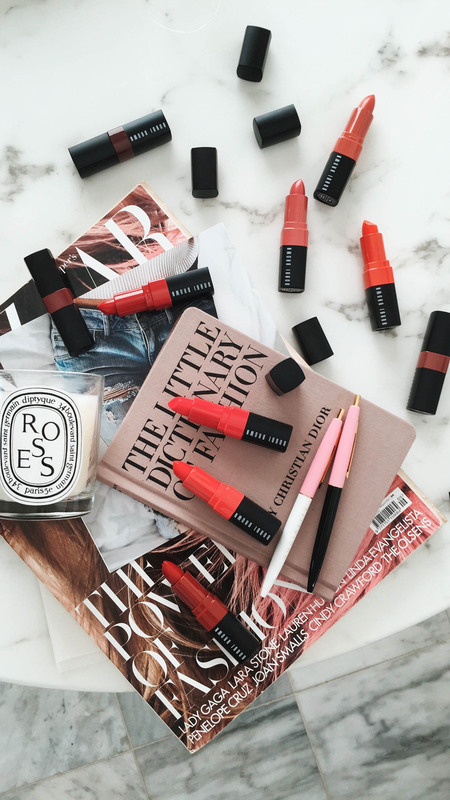 Summer Lipstick – Bobbi Brown – The only lipstick that doesn’t make my lips burn. I don’t know what Bobbi Brown is doing, but they’re doing something right! Thanks for these makeup post and tips! I have sensitive skin myself so I find that using natural, non harsh makeup is the way with me, but I understand the struggle of sensitive skin. I myself love wearing makeup but I hate the time it takes to put it on but I love the way it looks! So much struggle. That’s also a really cool fact to learn that your’e half Persian! I love hearing cool facts about people. I feel you on the love-hate thing. I love it one day, and then dread it the next. Great picks, though!! With the brow pencil, did you go too dark or too light? I use a benefit one, but I’m always curious if I’m doing it right. I had no idea you were half Persian!! I mean… your last name, but I just didn’t put 2 and 2 together! I’m actually a makeup junkie! Putting it on is my therapy. I don’t wear foundation, but I LOVE primers. They are so addicting. I also love the Rodial bronzers – perfect for everyday! I love the simplicity of your routine and of this post. When it takes a jillion high-end items to get a look, I’m out. Makeup and bank account overload! I love that you mix high & low end items!